Professor Jagat R Kanwar is the Head and team leader of Nanomedicine-Laboratory of Immunology and Molecular Biomedical Research (NLIMBR), School of Medicine, Faculty of Health, Deakin University, Australia. 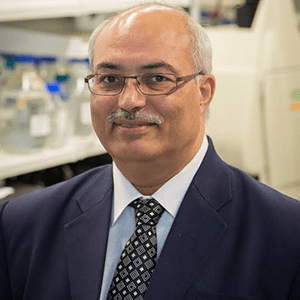 Professor Kanwar has an international reputation and expertise in investigating fundamental and applied molecular signalling aspects of pathogenesis of cancer, chronic inflammation and neurodegenerative diseases, thereby, leading to the development of treatment strategies from bench to bedside. He has more than 150 research publications in high impact factor and peer reviewed international journals, 27 book chapters and 3 edited books. Prof Kanwar’s research has generated several patents/PCTs with more than five licensed patents for commercialization to BioPharma industry. His group is currently working on drug discovery and nanomedicine for oral and systemic drug delivery of a range of natural bioactive and biomacromolecules (proteins/peptides, siRNAs and aptamers) for targeting survivin, HIF-1a and other apoptotic and inflammatory cell signalling molecules in cancer, chronic inflammation and neurodegenerative disorders. His research combines Immunology with state of the art and cutting edge techniques in Molecular Biology, Biochemistry, Nanobiotechnology and visualization to investigate the pathways in which key molecules are regulated in both normal and disease states. A number of in vitro human cell/tissue based co-culture models for cancers, microbial infections; autoimmune diseases; chronic inflammatory diseases (osteoarthritis, inflammatory bowel disease), gut health, neurodegeneration and immunomodulation have been developed by his group. Kanwar’s main research objective is to understand and target the mechanisms involved at the molecular and sub cellular level which gives us an edge over the prevalent targeting techniques. He carries out both academic and commercial research projects and develops new approaches for the diagnosis, treatment, and nanomedicine based new generation delivery systems. His recent research focus on locked nucleic acid (LNA) LNA-modified aptamers conjugated "double targeted nano-bullet nanocapsules" with natural anti-tumour proteins which specifically target cancer cells.